My daughter got me started in the art of home roasting coffee beans. She was in college at the time and living and working in a private on-campus coffee house. I had indocrinated her to the joys of coffee, and had for years ground my own beans, but her gift to me involving home roasting brought a whole new dimension to coffee’s presense in my life. Until around the time of World War I, most coffee was home roasted. In the early part of the 20th century some of the bigger commercial roasters and packagers of coffee began to spring up. Roasters like Hills Brothers and Folgers, to name a couple. People then began to buy their beans already roasted for the sake of convenience, but still ground their coffee at home. Then grocers, most notably A&P, began to install electric grinders in their stores. Now the consumer could buy the roasted beans and pour them in the grinder at the point of purchase, and go home with a pound of coffee all ready to brew. Soon coffee was pre-ground and packaged in vacuum sealed cans, so the housewife could take home a can of coffee that, until opened, would stay fresh for an indefinite time. But what the consumer didn’t know is that almost all pre-ground canned or packaged coffee, then and now, was made with inferior, run of the mill coffee beans. Americans didn’t seem to care. They had never known or couldn’t discern the difference between bad coffee and good coffee. In fact, many people prefer bad coffee because it’s what they’re used to. Bad coffee usually comes from high volume coffe growing regions like Brazil or Mexico, and often lacks any distinctive flavor of its own. It’s roasted dark, ground fine, blended with other varities of cheap coffee and packed. While it was never good coffee to start with, it has now undergone a transformation that makes it even less distinct and flavorless. Good coffee, on the other hand, is usually grown in small batches in unique soil from coffee bushes that have special qualities. The climate is usually colder and the elevation higher, and thus the beans are hardier and more complex. When they are roasted it is in small batches, and usually ground at the point of serving. They have unique, distinctive flavor, and produce a beverage that isn’t just hot, strong, and liquid, but it robust, flavorful, and able to deliver great pleasure to the coffee drinker with a discerning taste. But time is the enemy of good coffee. While the green, unroasted beans, will not noticeably degrade in a year or more if kept in a cool, dark place, once they’re roasted, coffee beans begin to deteriorate almost at once. Within 48 to 72 hours roasted coffee beans have lost a noticeable amount of their flavor. Ground coffee is even worse. It begins to lose flavor at once, only at a much more noticeable amount than roasted beans. Within an hour or two ground coffee is as tasteless as roasted beans are after 72 hours. Coffee beans undergo a complex series of chemical reactions when roasted, releasing oils, gases, and enzymes that actually are the bearers of coffee’s flavor. These oils are volatile and have a short-lived presence in the conveyance of flavor and aroma. The enzymes created in roasting are equally fragile and their influence is also short-lived. Once roasted it is best to store the cooled beans in an airtight container for no more than 48 hours. The prime flavor will be found if the beans are ground and quickly brewed about two to four hours after roasting. It is important that fresh roasted beans are quickly cooled and let to “air” out for an hour or two. The roasting releases many gases, most injurious to the coffee experience is carbon dioxide. By letting the beans “air” out, the carbon dioxide will escape and will not contaminate the flavor of the brew. Home roasters until relatively recently “roasted” their coffee beans in cast iron skillets on a stove top, of roasted them in pans in the oven. Today’s home roasters still, sometimes, use these more primitive, but totally serviceable methods. More often than not, however, they are using actually commercial roasters made for the at-home trade. Such roasters can be found for around $100 at the low end, and can exceed $1000 before getting into the commercial roaster market. 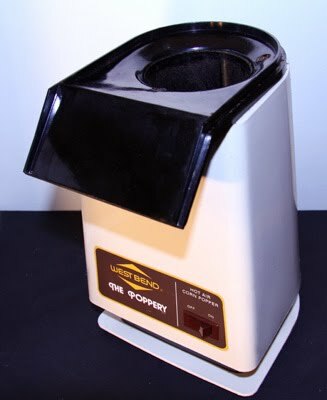 My “roaster” of choice is a West Bend hot air popcorn popper. They can be found at garage sales, thrift stores, and on eBay for as little as a couple of dollars and they do an excellent job roasting a great variety of beans. The West Bend has the hot air directed into the popping chamber from the sides and creates a swirling of the beans as they heat up and roast. This provides a more even roast and better control over the roasting process than more traditional hot air poppers which direct their heat up from the bottom of the heating chamber. I have used the more conventional style of popper and gotten some good roasts, but the roasting time is considerably shorter, hotter, and more touchy than with the West Bend. Speaking of roasting time. 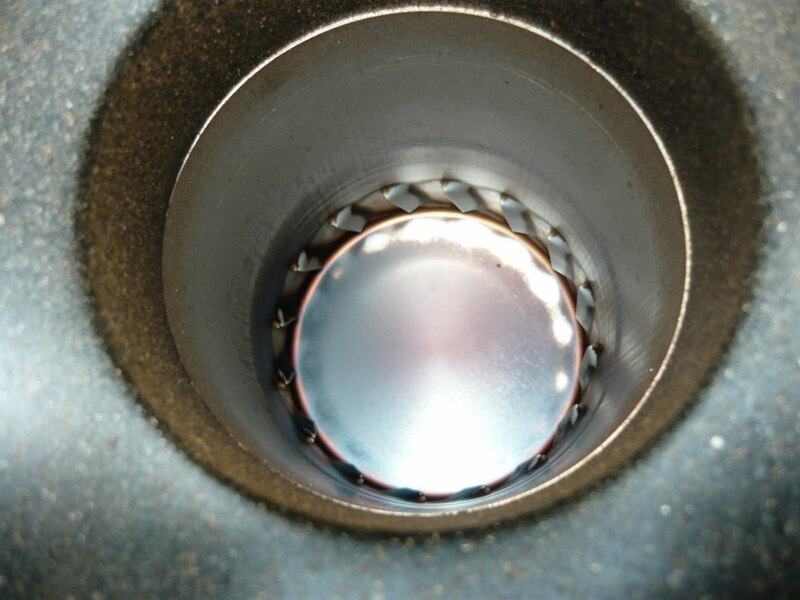 That is the most critical part of the process and the part that gives rise to the most complaints and concerns with people new to home roasting. Roasting coffee beans at home is more of art form than a science, unless you invest in an expensive automated roasting system, wherein you can set time, temperature, and cooling curves for each variety of bean to achieve your perfect roast. For those of us who roast by the seat of our pants, so to speak, it really does become an art form. Green, unroasted, coffee beans smell sort of grassy, or herby. They do not smell like coffee at all. It is only in the roasting process that coffee beans take on a usable, identifiable, form. That is why the roast is so important to quaffing the optimum cup of coffee. Each variety of bean has an optimum roast for best retaining its particular quality of flavor. Sumatra Mandheling, for instance, my favorite bean by the way, is best roasted to the darker end of the medium roast spectrum. At least for my taste buds. It is there that it picks up its musky, earthy flavor and its smooth chocolately finish. Roasted too light and it doesn’t develop that unique taste that defines it. Roasted too dark and it just becomes another robust, hearty, deep coffee with no distinctive flavor. Guatemala Antigua beans, on the other hand, are best if roasted to a solid medium roast. Go just a little too far in the roast and they taste more like a commercial ground coffee that you’d find at a diner counter. In other words, very generic, if a bit on the hearty side. Roast them too light and they have more of a weak tea quality than anything else. Whatever the roast, keep in mind that the darker the roast, in general, the less distinct, varietal flavor. Dark roasts tend to make all beans taste…well, burnt. The lighter the roast, the more caffeine, as well. The further into the roasting process you go, the more caffeine is driven off. If you think that dark, robusto roast you’re drinking is stronger, you’re wrong. How do I achieve the ideal roast for my taste from each of these beans, as well as others? Trial and error to some extent, and using an acquired sense of when the roast is done, relying on sight and smell for the most part. There is also what is known as the “crack” method, though I use it only loosely. 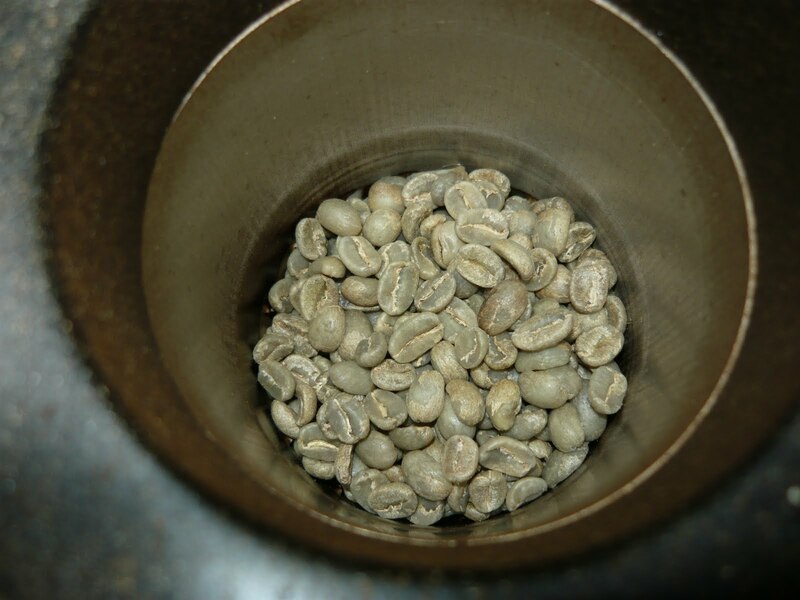 The crack of the beans refers to the actual pysical popping or cracking sound the beans make in the roasting process. The first crack you hear is supposed to indicate a light roast has been achieved. The second crack is a medium roast, and so on. This oversimplifies the crack method, but is a close approximation. The flaws in this system lie in a few variable factors. The ambient moisture in the beans being roasted is one, and the heat and how even its distribution is are a couple of others. I pay attention to the cracks, but I don’t let them dictate when a particular roast is done. I still rely on the experience I’ve gained from sight and smell in the five years I’ve been home roasting. Is my system foolproof? Certainly not, but then neither is any other system. That’s why roasting coffee beans is an art rather than a science. During the roasting process the green coffee changes dramatically. 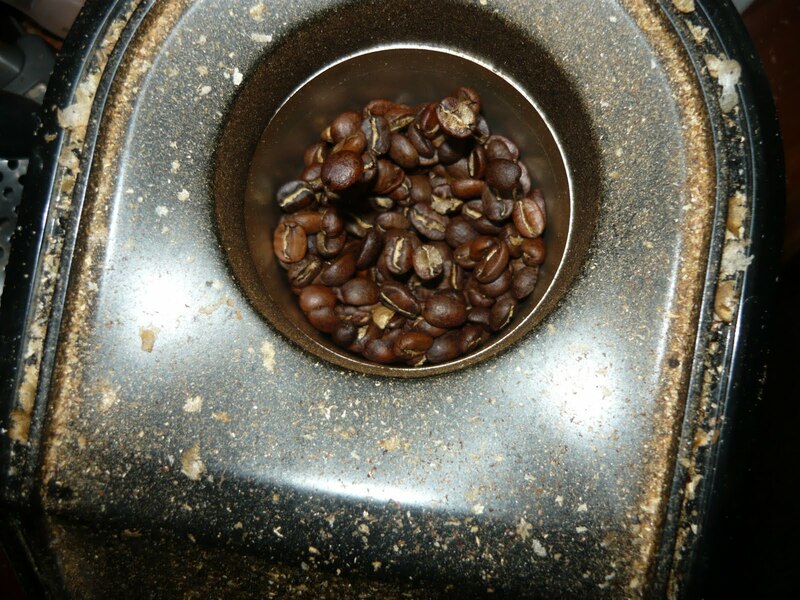 The process of roasting forces water out of the bean, causing it to dry and expand in the process. Some of the natural sugars in the bean are transformed into CO2 gas, and others are caramelized into the complex flavor essences that make a good coffee. 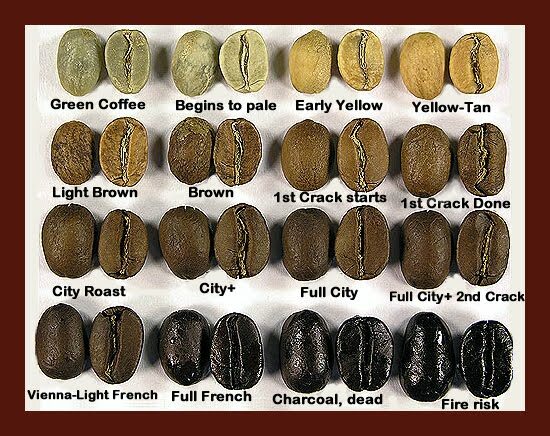 The colors darken and at the end of roasting the bean is about 18% lighter in weight and 50 to 100% larger in volume than when it was green. After roasting the, coffee continues to “de-gas”, emitting CO2 which helps protect the delicate flavor and aroma of the coffee. *Beans must be heated to temperatures of 370 oF to 540 oF. Faster air currents permit lower temperatures. *The coffee beans must be in constant motion to prevent scorching or uneven roasting. *Roasting coffee produces smoke which should be vented properly. *The roasted beans shed the outer skin during the roasting process and the light weight skins (called chaff) can make a mess if not handled properly. *Color: start with some coffee beans that have been roasted to the style you prefer. Use these beans as a guide, or refer to the chart at the bottom of this page. *Temperature: use a candy or deep fry thermometer to measure the temperature of the beans while roasting until you get the hang of telling when the beans are done. If using a roasting machine, this method is not necessary. *Smell: when the beans are nearly done the smell will change from a wet grassy vegetable smell to a coffee smell. As you gain experience, your sense of smell will become more refined. *Sound: Once the beans get hot enough they start to crackle as the water in the coffee turns to steam and is forced out. There are two distinct stages of cracking, commonly referred to as first and second crack. *Time: All other factors being equal, such as type and weight of the beans and the roasting temperature, you can duplicate previous efforts by timing the duration of the roast and recording this information for each type of green coffee you roast. This method is especially useful when roasting coffee in an oven or with a coffee roasting appliance. As soon as a batch of coffee is done roasting, it should be cooled as quickly as possible. The coffee beans will continue roasting from residual internal heat even after the heat source is removed. To speed the cooling process if roasting with an oven, stovetop, or campfire method, dump the hot beans into a colander immediately after removing from the heat source. If you have a large quantity of beans, using 2 colanders is even more efficient. Pour the beans back and forth between the 2 colanders slowly. If you do this outside and there is a slight wind you can effectively remove the chaff this way as well. It is not necessary to remove every bit of chaff as it will not affect the flavor in small quantities. Roasting coffee produces a bit of smoke, and this will have to be vented if you roast coffee indoors. A stovetop exhaust fan is typically adequate to vent smoke from most roasting efforts unless a large quantity of coffee is roasted very dark (the darker the roast, the more smoke is produced). In the absence of an exhaust fan, a portable fan in front of an open window will usually take care of the smoke. Fresh roasted coffee reaches its peak flavor and aroma about 24 hours after resting. A 24 hour rest period is not necessary but is preferred by many coffee lovers to allow the beans to fully develop their flavor and aroma. The rest period allows excess CO2 to dissipate and permits the coffee bean chemistry to stabilize. Follow these guidelines, and do some more research on your own if necessary. There are many instructional video on home roasting to found at youtube.com and elsewhere. If you’re like me, you’ll discover a whole new hobby, and every cup of coffee you make at home will taste better and be fresher than any you’ve ever had before. For green beans and various roasting supplies, including commercial roasters, check out some of the websites below, or do a Google search. I buy my beans from a local coffee shop that buys bulk beans and roasts there own, so that could be a choice for you if you live near a coffee shop with a roaster. Wherever you get the beans or other supplies, don’t hesitate to experiment in order to achive the optimum results.